Accuracy is the best neutrality. It’s all about the bitumen. Last Tuesday, Sept. 20, 2011, the District of Kitimat sponsored an “educational forum” here at Mount Elizabeth Theatre on the controversial Northern Gateway pipeline project which, if approved, would carry bitumen from Alberta to the port of Kitimat and on to Asia. There was an hour of presentations covering all sides the debate, followed by a question and answer period. While the Kitimat meeting was underway the rest of the continent, and especially the media was focused on another pipeline project, the proposed Keystone XL project that would carry bitumen from Alberta down to Texas to be refined there. Type in “Alberta tar sands” into Google, and you get 852,000 results. Perform a search for “Alberta oil sands” instead, and you end up with 334,000 results–not even half that. And if you change “Alberta” to “Alberta’s,” the gap widens even further. So why do most media outlets tend to default to the phrase “oil sands”? Is “tar sands” pejorative? Or do both terms carry their own bias? Pritchard pointed back to an article in the Tyee posted after the Calgary Herald attacked the late NDP leader Jack Layton for using the term tar sands. Interestingly, the Calgary Herald didn’t so much take issue with the statements themselves, as it did with his vocabulary. Nearly two weeks later, the Herald was still ruminating about Layton’s and Obama’s language choices. “Tar sands is inaccurate and pejorative,” wrote columnist Paula Arab. However, most of the mainstream media seem to have bought into the idea that if the sandy hydrocarbons found in northern Alberta are called “tar sands” (it certainly looks and smells and feels like tar) it is pejorative, while “oil sands” are neutral. As comments on both the Tyee and Open File stories show, those who tend toward the environmental point of view consider the term “oil sands” energy industry spin. Open File asked the Canadian Press for their take on the subject, since the CP Stylebook (like its equivalent from the AP in the United States) is considered the usage Bible not only for the Canadian media for most non-academic writing in the Canada. Canadian Press style calls for the use of the term “oilsands” (all one word), as it is both the official term used by the petroleum industry and the least susceptible to misinterpretation or misunderstanding. It is also in keeping with accepted style for terms like “oilpatch” and “oilfield” — consistency is a critical element of any effective writing style. It’s also important to choose the most neutral term available. “Tarsands,” while at one time the industry’s chosen term, has been appropriated in recent years by opponents of the oil industry and has taken on political connotations, so we choose to avoid it. So let me get this straight: CP deems the term preferred by the petroleum industry “neutral,” while the term “appropriated” by opponents of the oil industry isn’t. They obviously have misconceptions of the meaning of the term neutral. An hour after I read the Open File story, I turned to CBC TV News and watched Margot McDiarmid’s item on the Keystone debate. In her first reference to the Keystone pipeline, McDiarmid used the term “oil sands bitumen” to describe what would go through the Keystone to Texas. Relatively accurate. But then at the end of her item she said “oil” would be flowing through the Northern Gateway Pipeline to Kitimat. Even though I worked in radio or TV for three decades and know the necessity to keep things as simple as possible in a short item, I was appalled. To describe the bitumen that is going through those pipelines simply as “oil” is misleading and inaccurate. If you’ve sat through briefings, attended hearings and read the documents, it is clear that bitumen behaves differently in a pipeline from conventional oil, whether it is crude oil or refined oil. That difference is at the heart of the debate over both pipelines. It appears that no one outside of the local media here in Kitimat and media along the Northern Gateway route seems to understand that difference, not even at the centre of the current debate about the Keystone XL in Nebraska. So I checked. What term is the media using to describe what will flow through the Keystone and Northern Gateway pipelines? The media is all over the place, calling it oil, crude oil, crude, tar sands oil, oil sands crude, oil sands bitumen. Today’s New York Times uses the term “oil pipeline” to describe the Keystone project. On first look, it might seem wrong to allow TransCanada Corp. to build the 1,700-mile Keystone XL pipeline to carry oil from Alberta, Canada, to the U.S. Gulf Coast. What’s more, a new conduit would seem to only encourage the further development of the Athabascan oil sands in Alberta. This is a dirty business, to be sure: Vast tracts of spruce and fir are cleared to make way for open-pit mines, from which deposits of sticky black sand are shoveled out and then rinsed to yield viscous tar. For deeper deposits, steam is shot hundreds of feet into the earth to melt the tar enough that it can be pumped to the surface. Then there are the emissions associated with mining Canadian oil sands: It produces two and a half times as much carbon dioxide and other heat-trapping gases as oil drilling in, say, Saudi Arabia or west Texas. Keep in mind, the U.S. is crisscrossed by thousands of miles of pipelines carrying crude oil, liquid petroleum and natural gas. One of these is the Keystone 1 pipeline, which already carries crude from the oil sands. Yes, these pipes sometimes leak — spectacularly last year when almost 850,000 gallons of oil spilled from a ruptured pipe in Michigan. Far more often, when leaks occur, they are small and self-contained. After the public hearings, the U.S. should give TransCanada the green light — and then make sure the company manages pipeline design and construction with care. Get the picture. As far as I can tell, no one, no one in the major news media is accurately describing what will flow through the Keystone XL and Northern Gateway pipelines. Again the accurate descriptions come from the local media in northwestern BC who have attended years of local briefings and hearings. Say “oil” and, although it is a generic term, most people think of the substance you put in an engine, ranging from the thick, black gooey stuff that goes into a two stroke boat engine, through the lighter oil that goes into your car or the even lighter oil used by model makers. “Petroleum” would probably be a better generic term. 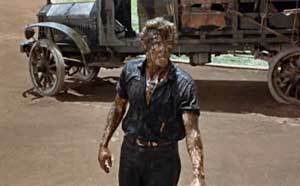 Say crude and most people would think of James Dean covered in the crude from the gusher in Giant or similar movie scenes. Or for those old enough to remember, they think of the opening of the Beverly Hillbillies when the “bubbling crude” comes out of the ground at Jed Camplett’s farm. So what is going through the pipelines? While Enbridge uses the term “oil” in its promotional brochure on Nothern Gateway (pdf file), in the briefings here Enbridge officials always talk of “bitumen.” They know that the people living in Kitimat, again whether supporter or opponent, have done their home work. Everyone here knows it won’t be “oil” in the pipeline. But it seems that the public relations branches of Enbridge and TransCanada still believe they can spin the media into reporting the pipelines will just be carrying oil. condensate: A low density mixture of hydrocarbon liquids that are present in raw natural gas produced from many natural gas fields or which condense out of raw gas if the temperature is reduced below the hydrocarbon dew point temperature of the raw gas. What to call the pipelines and the product? So let’s talk about Northern Gateway and Keystone XL first. These pipelines are different from the other pipelines that Bloomberg and other media say crisscross North America. These pipelines will be carrying diluted bitumen, not oil, not crude. When the public think of oil they think of a lubricant that enhances flow, not a gritty substance that has to be diluted before it can move. Diluted bitumen is a mixture of sand and soil and crude hydrocarbons, with various petrochemicals added to so that that mixture can actually get through the pipelines. The use of diluted bitumen is raising all kinds of questions. There were questions at last week’s forum on the effect of the friction from the sand on the stability of the pipelines. There were questions at the forum about the corrosive nature of the condensate added to the bitumen on the stability of the pipelines. These questions do not arise when it comes to conventional pipelines which have been built for the past century. While there have been major oil spills for decades on land and sea, there has never been a major spill of bitumen in either a pristine watershed or the ocean. There has never been a major spill involving this mixture of bitumen and condensate. Unfortunately, the ultimate answer to the question of how dangerous such as spill could be, will only be found out if there is disaster. The Northern Gateway Pipeline follows the route of the Kitimat River. One of the most frequent questions is what happens to the town’s water supply if the pipeline breaks. There are thousands of pages on the Joint Review Panel website that show that Enbridge and their consultants have done all kinds of tests, modelling and contingency planning to support their stand the pipelines and the tankers are as safe as possible. There are documents from environmental groups and others that take the opposite position. So to maintain its already shaky credibility the media must be accurate. Accuracy is the best form of neutrality. The media should call what is going into the Northern Gateway and Keystone XL pipelines “diluted bitumen” on first reference and “bitumen” on subsequent references. It is crude oil mixed with sand and the condensate chemicals. To call what will go through the Northern Gateway and Keystone XL pipeline simply as oil or crude is leading to gross misinterpretation and complete misunderstanding. The media should continue to use oil when they are referring to conventional oil flowing through a conventional pipeline. The public isn’t stupid. If you ask a Grade Three student in Kitimat about bitumen and condensate you’ll get a pretty good answer. If the media has to produce sidebars, graphics, interactives, explainer items, to explain what bitumen is, the sooner the better, so that those taking part in the debate and those reporting it know what they’re talking about. It is clear that the Canadian media managers who decided in the mid 2000s that the term “oil sands” was more neutral than “tar sands” blundered. Yes the environmentalists do use “tar sands” and for some it can be pejorative. But if you have ever seen the stuff it certainly is tar. Just as Enbridge uses “oil” in its brochure on Northern Gateway but says the real thing “bitumen” in meetings, “oil sands” is the preferred energy industry spin term. The use of the term “oil sands” reduces media credibility. Using “oil sands” likely amplifies the general belief that the “corporate media” is in the pocket of big business and thus reduces the credibility of the shrinking numbers of hardworking reporters left working in the field. Here crowd sourcing and social media help. There are postings both on Open File and Tyee saying the terms “bitumen sands” or “bitumen-bearing sands” are proper neutral terms. I have used the term “sandy hydrocarbons” in this article, I came across it in a briefing document some while ago and it stuck in my mind (though I can’t remember where I saw it). It is up to public editors, ombudspersons and style book editors to make the call here for their organizations. I believe that if the media starts using “bitumen sands” as a technically accurate and neutral term for what is found in northern Alberta, the readers and viewers will quickly accept it. Kitimat on the process, June 16, 2011. The big picture. Why isn’t the environment in the style books? There is a bigger problem that I discovered when I was looking into this issue. I checked the Canadian Press Stylebook to see what the editors said about the environment and found nothing. Absolutely nothing. There are chapters on business news, entertainment, sports, even travel, but nothing on environmental coverage. A very quick check with copy editor friends seems to have come up with same result across the media. Media stylebooks don’t consider the environment important enough to have a full chapter. (I may have missed some of course, the check was very quick) yet environmental stories are in the news every day. The Associated Press was founded in 1848, in part so the New York newspapers could cooperate in getting the latest business news from Europe, first from ships and then from the transAtlantic cable. So business news has been essential to the media for at least a century and a half. This, I believe, has created this historical, and probably unintentional, institutional bias that favours word usage preferred by business. If media style books had environment chapters then the question of oil sands/tar sands would have been considered more thoroughly and the “neutrality” of “oil sands” questioned. Who knows what other environmental issues have been considered only superficially because stylebooks don’t have a chapter on the environment? Reporters in the field are often left angry and frustrated by rulings from public editors and ombudspersons who may, despite their efforts, err on the side of “neutrality” rather than “accuracy” especially in this era of extreme polarization. Media managers often take the path of least resistance, especially if they are being inundated with complaining e-mails and letters. A stylebook chapter on the environment should stress accuracy over neutrality. Thus it serves the public. A rigorous chapter in a media style book on the environment (and also on science which is also lacking) would give guidance to reporters in the field, editors at the desk and allow managers to tell the complainers with agendas just how the issue has been examined. This site has always used bitumen to describe what will be in the Northern Gateway Pipeline. From now on it will use bitumen sands in copy, and will use tar sands and oil sands in direct quotes as appropriate. I hope the rest of the media will follow. Disclosure: I worked for CBC.ca from 1996 until I took early retirement in 2010. I have also freelanced for both Canadian Press and OpenFile.